It’s hard to believe it but somehow another year has rolled around and Whispering Earth celebrates its second birthday today. So once again I would like to mark the occasion with a brief retrospective of my highlights from the year past and another little giveaway. I couldn’t decide which of them to offer so I have settled on two small gifts, both seasonal in their own way. Firstly, as it is Valentine’s day, I will be giving away a 20ml dropper bottle of organic rose otto essential oil blended with organic jojoba at 2.5%. 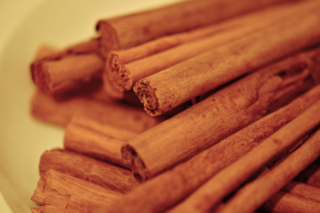 This can be used as an addition to massage blends or face oils or rubbed into the neck as perfume. However I most recommend you use a few drops massaged over the heart area in a gentle circular motion as a meditative and nurturing way to relax, encourage deep breathing and open your heart. As you may know, rose otto is the most expensive essential oil in the world and 500 roses go into making just the amount that is found in this blend. 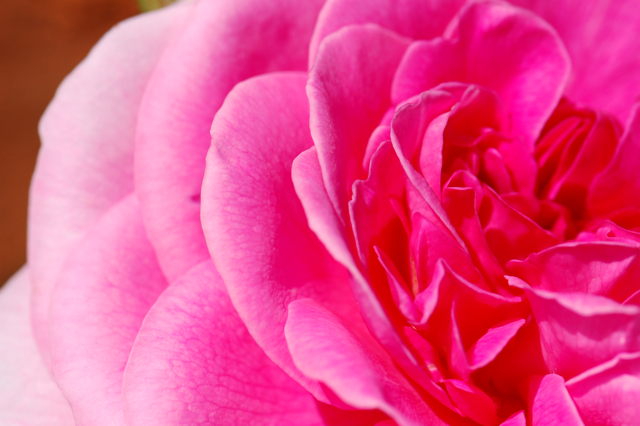 Therefore it is so important to use rose, or any oil, with the awareness of how precious it is and with every drop valued as a gift from nature. As the snow is only just beginning to melt here I thought I would offer an A4 sized print of my Winter Solstice picture as an alternative for those who would prefer it. It was painted last winter when the snow lay thick on the ground and we were unable to get to work for several days. To enter the giveaway just leave a comment below this post with your name and the item you would like to win. I will pull two names from the hat in a weeks time. As both items are light I am happy to send them abroad. Now I shall turn back, briefly, and remember the highlights of a year spent in nature; connecting, observing, harvesting, writing and rejoicing in the many gifts and subtle lessons she brings. Last February I was enjoying playing with cinnamon and reading inspiring books by the fire. In March I was dreaming of violets and exploring the new growth of elder through Goethean observation. 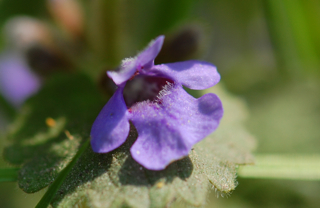 April saw me celebrating spring flowers and enjoying ground ivy. 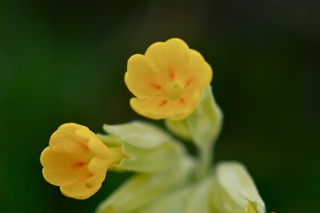 In May I was making hawthorn flower remedies and loving the abundant cowslips. June arrived to find me making salves, ointments and balms and talking about milk thistle. 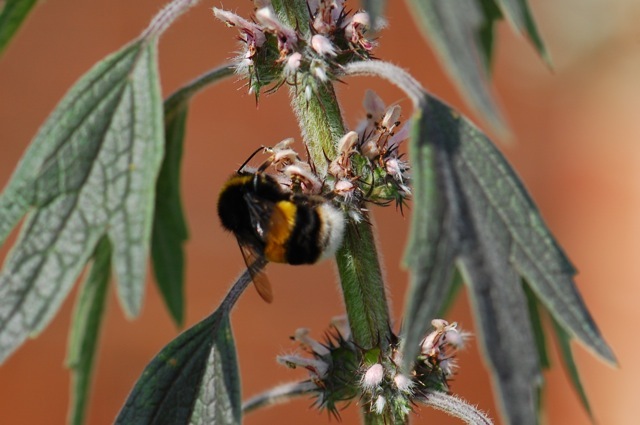 In July I was happy in the company of Motherwort and enjoying simple summer teas. August saw me making up poultices and compresses and celebrating the wildlife in my garden. 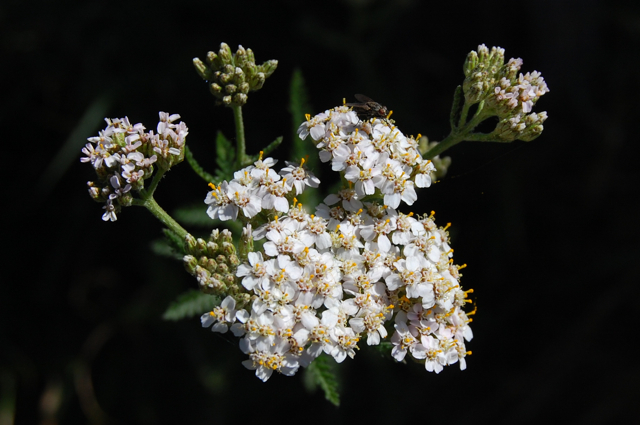 During September I spoke about two old favourites of mine, Yarrow and Calendula. By the time October rolled around I was ready for some nourishing herbal soups and a bit of philosophising. November came and I was in the mood for storytelling as well as sharing some tips on making breast massage oils. And then December and a series of cream making posts beginning with this one. 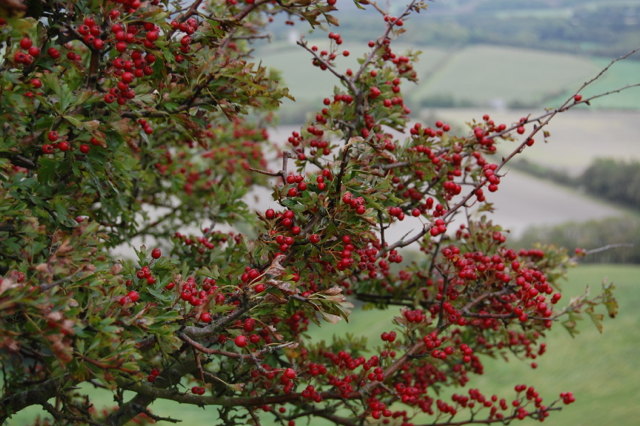 Also a round up of my year spent with Hawthorn. 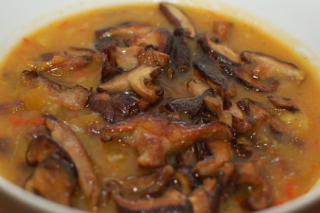 Finally, my blogging year ended in January with thoughts on interbeing and some pictures of my Dad’s marvellous mushrooms! I do so hope you have enjoyed at least a few of the posts I have shared over the year and I hope this next year will be just as magical. I would like to round up by sharing a poem that I love with you. Part celebration of the natural world and part love poem, it stirs a sigh and a smile from the vast unknown. Your year has been so inspirational! I thank you sooo much for sharing it with us dear Lucinda! What a nice poem!Rose Otto is on the top of my wish list this year, as it is my number one herb to learn in depth with my Springfield Sanctuary Apprenticeship, but…. I can’t help myself, I would like to throw my hat in the ring on your gorgeous, adorable print! When I enlarged it I got joy tears, it is so beautiful, just like you! love and hugs xoxox thank you for the opportunity! Thank you so much Leslie. Your lovely comment bought me joy tears too! I will remember to forward you any rose info that I come across. I’m so glad you are enjoying it. I’ll add your name to the hat! 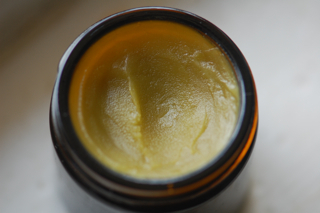 I use a dropperful of rose otto EO when I make the lucious face cream to use. Feels and smells luxurious. Please add my name for the rose otto giveaway. How awesome for you to do that. I love your posts and newsletters. Sounds lovely, you can’t beat a rose face cream can you, it always brightens my morning. Thanks Tony, I’ll add your name to the hat! I love the print of your painting! Thank you for your wonderful blog! Thank you Marlene. It’s always special to get nice comments. Sounds like a wonderful way to spend the year! I love your print – absolutely beautiful. 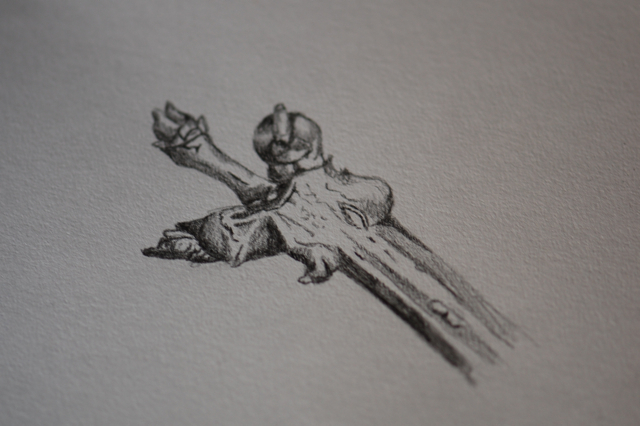 I’ve always envied those who could draw. Not one of my talents, sadly. That being said, I would like to toss my name in for the Rose Otto oil. Great, I’ll add you in! Oh how lovely, I’d love to hear more about your discoveries some day. Rose is so special isn’t she. I’ll add your name in and wish you luck. Hi Laura, Thanks so much for your kind words, I’m really glad you are enjoying the blog. I’ll add your name to both giveaways. Hi Lucinda, I have so enjoyed your blog since I found it – so beautiful and inspiring, and such useful information. Thank you! I would love the rose oil, and enjoyed looking at your winter solstice picture. Enjoy your new year with nature! Thanks Maggie, I’ll add you in for the rose. I hope you also have a wonderful year! Ah that’s lovely. Thanks for stopping by and I’ll add you into the draw for the print. A wonderful encapsulation of your year. Sounds like it was enjoyable and productive too. 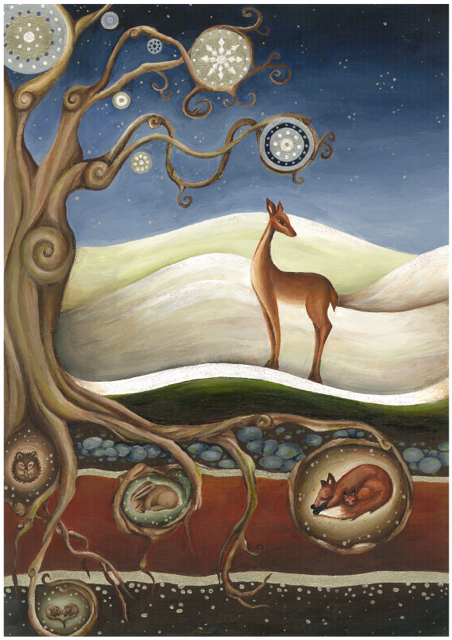 The Winter Solstice painting is just beautiful! It was a lovely year though it does shock me a little to think how quickly it has gone! Gefeliciteerd! as we would say in The Netherlands. Lucinda, you’re a true inspiration. I’ve been writing for many months now on a novel about nature’s rythm and there have been moments that I’m suffering from a writer’s block. A quick (or long) visit on your blog makes the inspiration flow again. Thanks! Thank you Anneke. It brings such joy to my heart to read your lovely comment and reflect on how connected we all are. You MUST let me know when your novel is finished. Will there be a translation in English available do you think? what a lovely idea! Your winter solstice painting is stunning! Since Imbolc we have been spring cleaning and decluttering (or trying too!) and decorating and I have a spot on a newly painted wall that would definitely benefit from such a lovely piece. I’ll keep my fingers crossed! Hi Jen, Thank you so much. I must say I visited your blog and your leaf jewellery is just gorgeous! I tried to leave a comment but blogger doesn’t seem to like me much! I’ll add you to the give away and wish you luck. thank you so much, I’m so glad you like my work! Sorry about the comment, I’ll have a look at my settings. Hello, Spring is slowly awakening. I enjoy your blog and it inspires me! Thank You for the inspirations and knowledge! Roses are very special and I would love to “throw my hat in the ring” as someone else so nicely put. I also am impressed by your art work but the smell of roses in this time of winter makes me swoon. Ah yes, it uplifts and opens like nothing else doesn’t it! I will add your name into the hat. All the best. Thank you so much for sharing your abundance of knowledge! I am learning so much!! Though it’s a hard choice, I would love to win the rose otto oil. Hi Deb, I’m so happy that you find it useful. I’ll add you in for the rose. take good care. Congratulations with the second birthday. Thank’s for sharing this nice poem Lucinda. Your winter solstice painting is so beautiful but when I have the opportunity I would love the rose oil. Happy Birthday! I love that poem and the richness of its words. I so wish I could write poetry but it takes me thousands of words to get my point across. Thank you also for the richness of your posts. I save them as much for the photography as for the words themselves. Thank you, that’s lovely to know as sometimes I worry that I get too carried away with my pictures and neglect the info a bit! It’s a beautiful poem isn’t it. I bought a poetry anthology a few months ago and that and one other were the only poems I liked but it was worth it just for them. I like the idea of summing up each month and remembering them…very nice. I think I often forget the richness of each day of the year, and remembering with thoughts and images does help. And thanks for the poem…beautiful. I would like to add my wish for the print…it is beautiful! Yes I enjoy doing the re-cap, it’s amazing how many posts you sort of forget about! I’ve added you in for the print and thank you for your kind words. Thank you for all your fantastic writings. I’ve enjoyed each one. Please through my name in the hat for either of your lovely give aways. 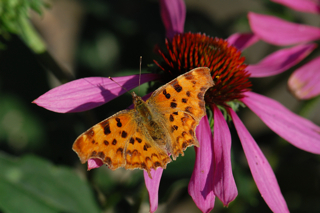 Enjoy the first glimmerings of spring! My sweet flower, thank you again for your loveliness. It was the elder magic that drew us together was it not? I was out photographing the new leaves on the elder this morning, so tiny and fresh! I subscribed to your blog last Spring and have been enjoying it ever since! It’s so lovely to receive a breath of fresh air through my inbox from across the sea. Thanks for the inspiration and education:). Thanks Abigail. I’m so glad you are enjoying the blog from so many miles away, I hear Oregon is very beautiful! 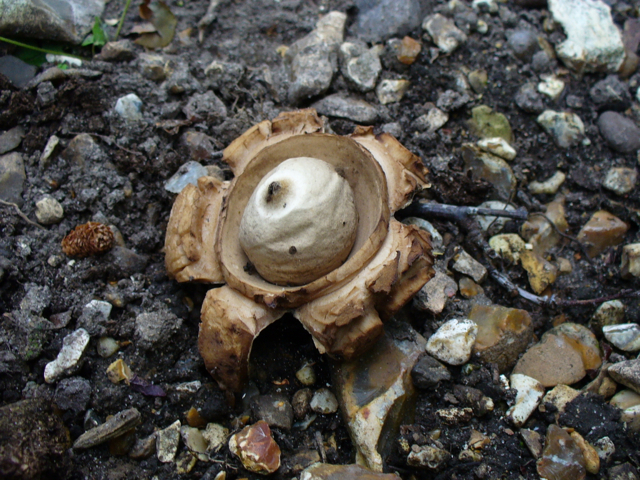 An amazing year of whispering earth, thank you Lucinda for sharing so many beautiful things. Nature is so wonderful. Please put my name in the hat for the print, I love it! Your blog was the first herbal blog I started reading on a very regular basis. I know I don’t comment much, but I am here. I’ve actually looked at your posts from time to time for reference and enjoy your wonderfully fresh way of writing. Its so amazing of you to offer a giveaway like this! The first thing that came to my mind was–and has been a lot lately– SEEDS! 🙂 But this is even more wonderful. So count me in! I’ve never smell rose oil before. Thanks Arya, it’s wonderful to know you are there and enjoying the posts! Seeds would actually be a lovely idea for a giveaway, though I wonder if there might be restrictions on sending them abroad.